Having ordered several pounds of apples a while back, we needed to get on using them! My daughter and I were “inspired by” (her more polite term for bastardization) a larger tart, but we decided to make individual tarts that could be frozen and baked later, mainly by hungry children after school. 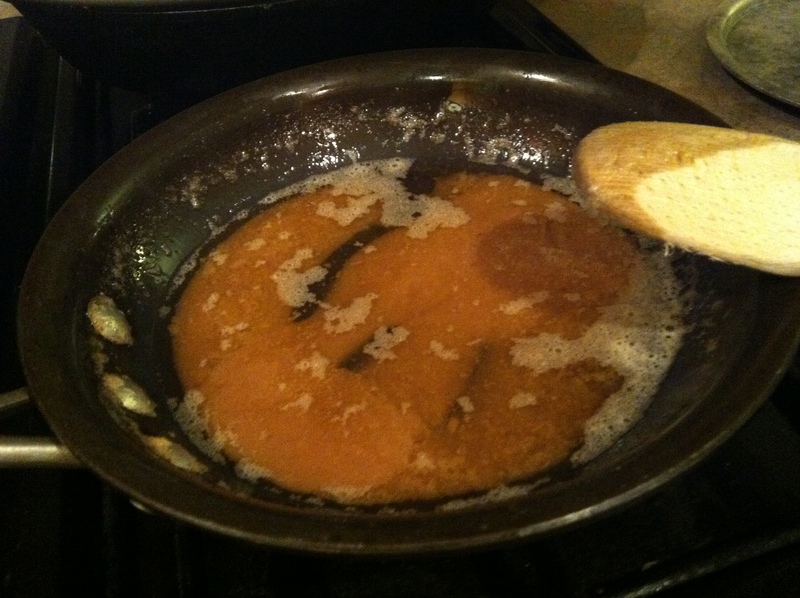 Melt butter in a small pan, then add the sugar and cook until it is a nice dark brown. 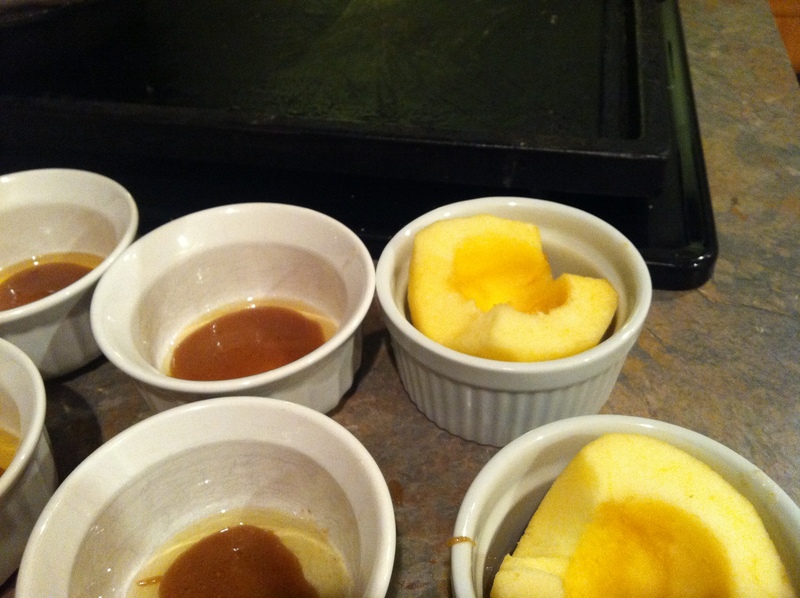 Divide the butter mixture evenly among the ramekins, then place an apple half in each ramekin, cut side up. Cut the puff pastry into eight squares and top each apple with a square of the puff pastry, tucking the corners into the dish. At this point, we put most of the prepared tarts into individual sandwich bags and froze them individually for later use, like I said. Frozen or fresh, they baked for 25 minutes, until the pastry is golden brown. 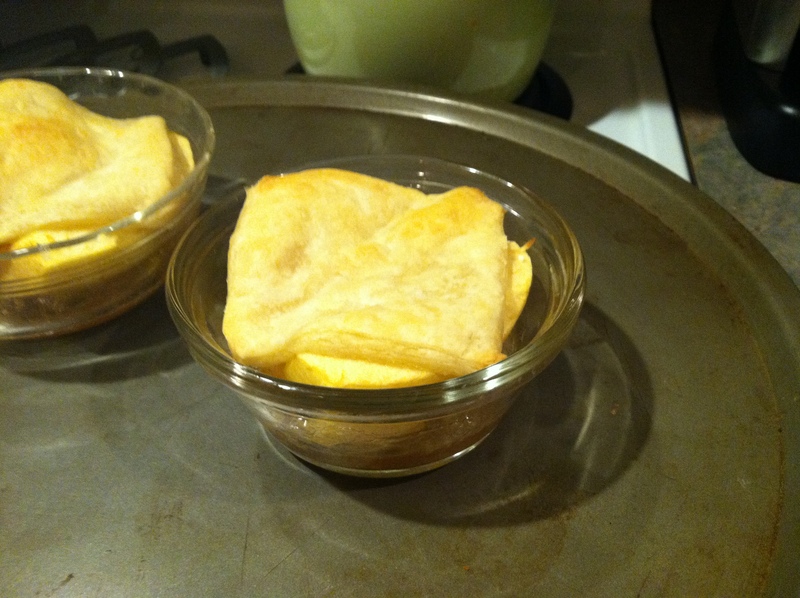 When finished, place a plate or dish over the ramekin and carefully invert, so the tart falls onto the plate. 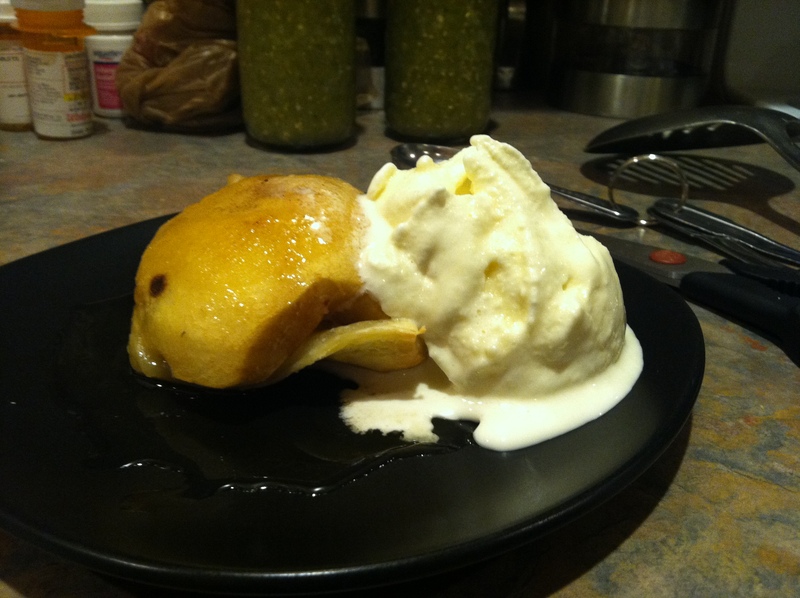 You get a little tart with an apple mound on top! C is for carrots and chard. I absolutely love the color variety in the baby carrots (orange and yellow and purple) and the Swiss chard (yellow and red stems)! With all those vivid colors, it has to be healthier, right? 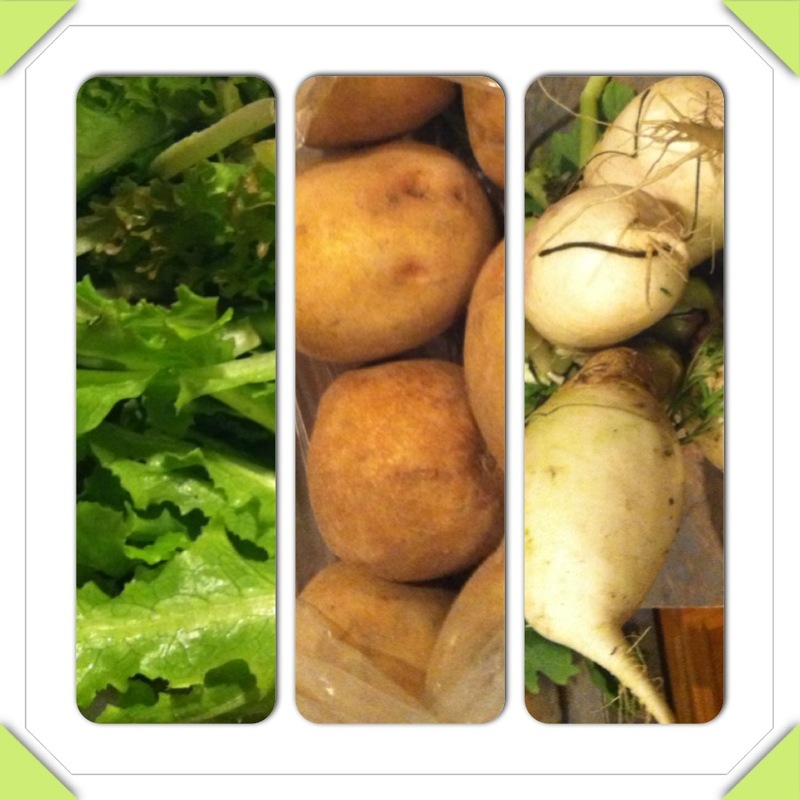 Then we have salad greens, potatoes and turnips. I ordered both Russet and Yukon Gold Potatoes. Breakfast potatoes are one of our favorite weekend breakfasts. Some of the carrots were roasted to accompany an herb crusted roast (from my locally sourced beef) for Christmas Dinner. My daughter and I are debating how we want to use the beets. My husband loves roasted beets, but we all really enjoy pickled beets as well. Since she is gone for a week spending the New Year in the mountains with family, I think we will be roasting beets this time. Cue evil cackle – ha ha ha ha! Sorry about that; we have watched lots of Wizard of Oz movies this past week and I have wicked witches on the brain…. The turnips roast nicely with other vegetables and Kirsten at Farms Fresh Feasts commented in the past about a smooth turnip soup that I might try. 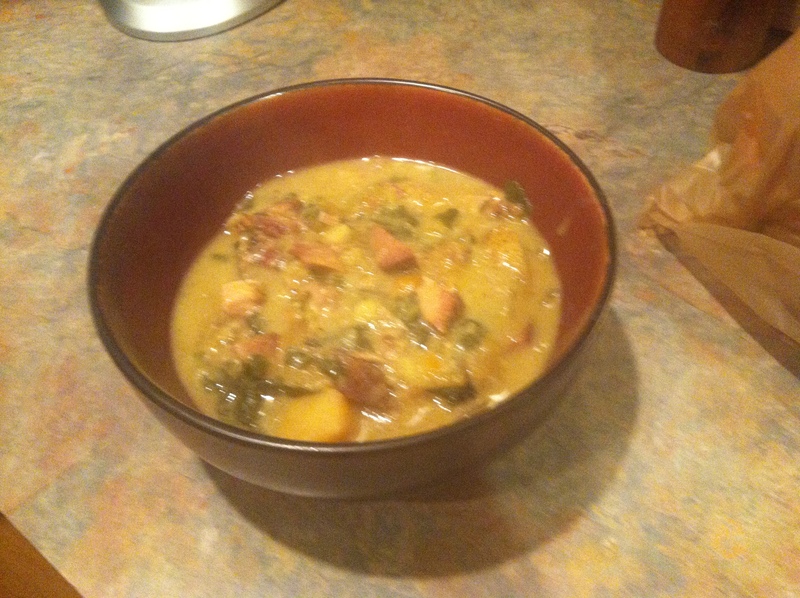 Soups are good now that it has been so cold for so long. 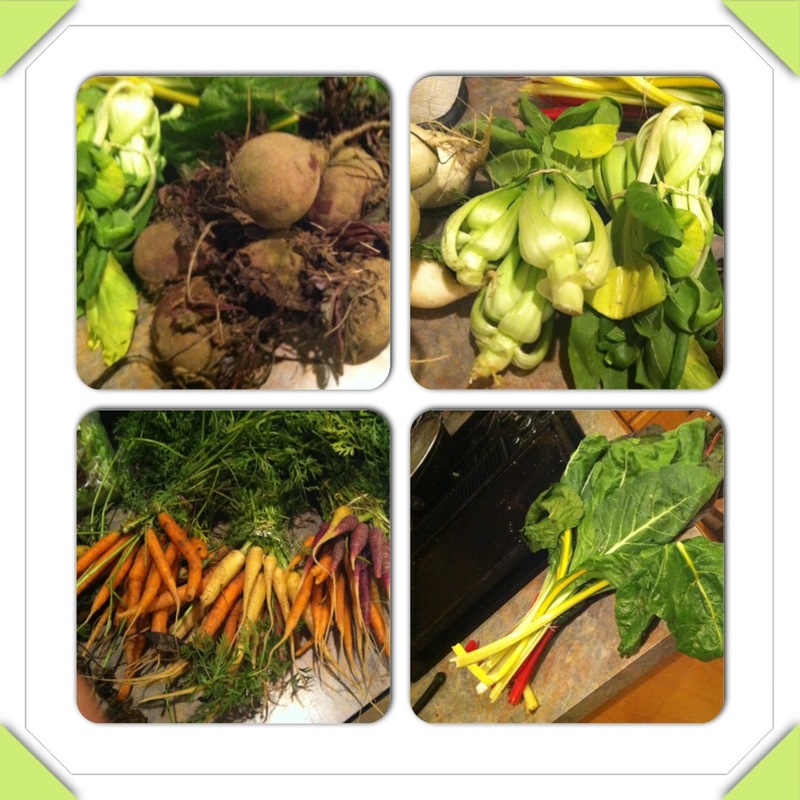 We are eating quite well this winter so far. Box #2 had Swiss chard, organic salad greens, spicy salad greens, spinach, fresh sage, two types of radishes, turnips, and Yukon Gold potatoes. And I have been substituting up a storm – Apparently recipes have become mere suggestions that I really don’t even actually consider following. For example: “Sauteed Kale with Garlic and Red Onions” became Chard with garlic and Walla Walla Sweet Onions, Cranberry Apple Tart (that photo on the far right using apples and cranberries from Box #1) which was supposed to use pre-made pie crust, got a completely made up tart crust made out of frosted shredded wheat crumbs. When I made the cranberry apple tart, I searched online and found an experimental tart crust made with shredded wheat, but I didn’t even fully follow that. The tart was yummy, but the crust was VERY, VERY sticky – the left over “frosting” from the frosted shredded wheat got me. Next, I used some of my frozen pumpkin puree for Pumpkin Cheesecake Bars, again with a shredded wheat crumb tart crust instead of a graham cracker crust. The flavors worked great, but the crust was still very sticky. I can tell I need to keep adjusting the recipe, but we will keep eating tarts until I am successful – as God is my witness, I WILL bake with my shredded wheat crumbs! I admit, this has become a personal problem…. It has been an odd summer. My farmer was having problems with his web site, so I was unable to place orders for quite a while. I also have a hard time ordering by 9:00 AM the day before the pick up. I tried ordering several days ahead of time, but it wouldn’t accept my order too many days before the drop off. 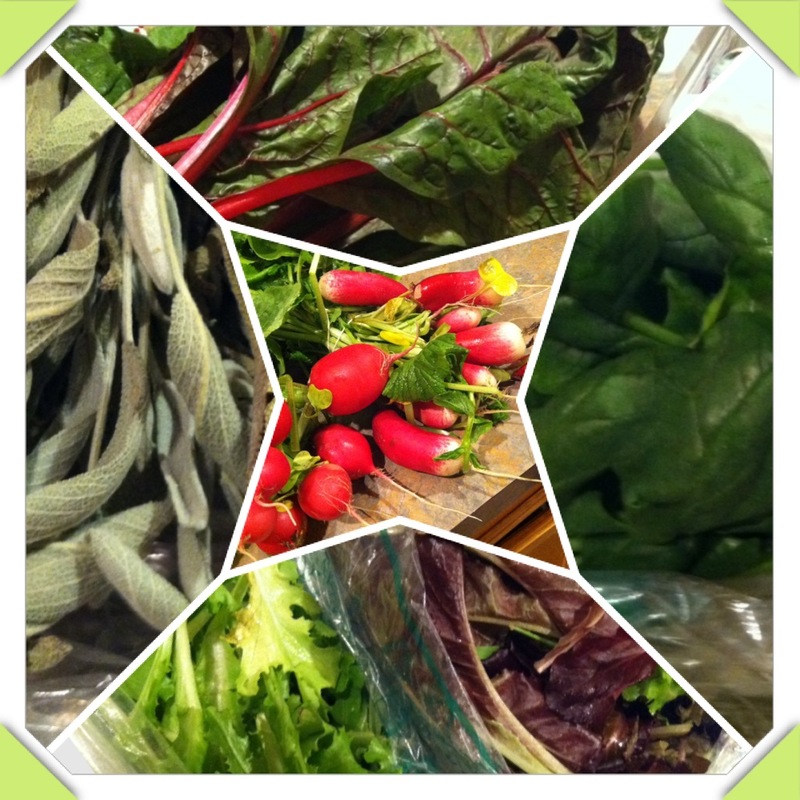 I miss my old CSA where the farmer dropped off what he had and all I had to do was pick it up. Sigh. 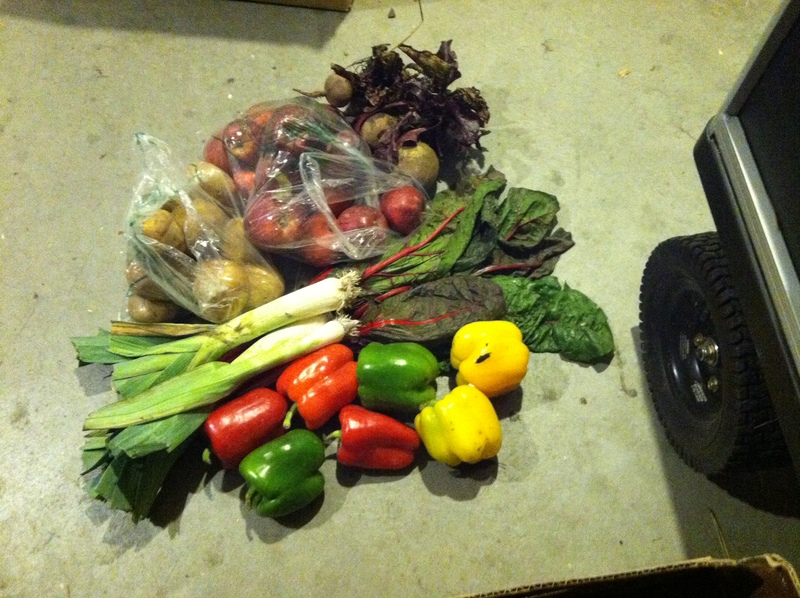 5 lbs of apples;, 3 lbs of potatoes, 2 lbs of beets, swiss chard,, basil,, italian parsley, bell peppers, and leeks. I’ve been wanting apples to make apple cake, maybe salted caramel apple butter or apple crisp. I haven’t seen any cranberries listed on the pick sheet yet, and I am starting to get concerned. Thanksgiving is only 3 weeks away! 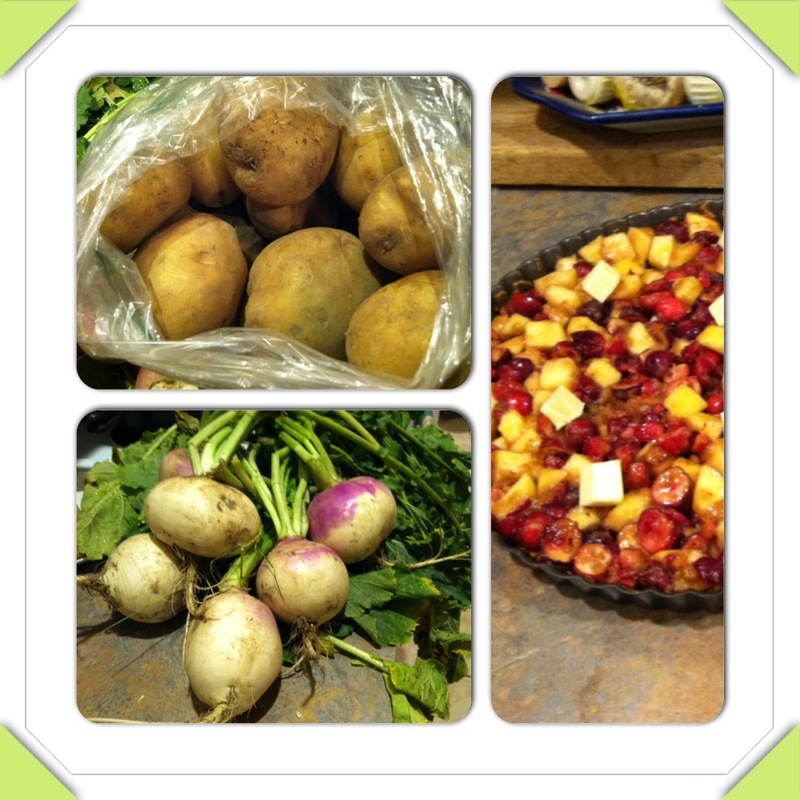 Kirsten at Farm Fresh Feasts posted an amazing cranberry sauce that I really want to try this year. This dish was a collaboration with my daughter. She has been wanting to write for the blog, so she did the cake recipe (It was based on a recipe in her cookbook). 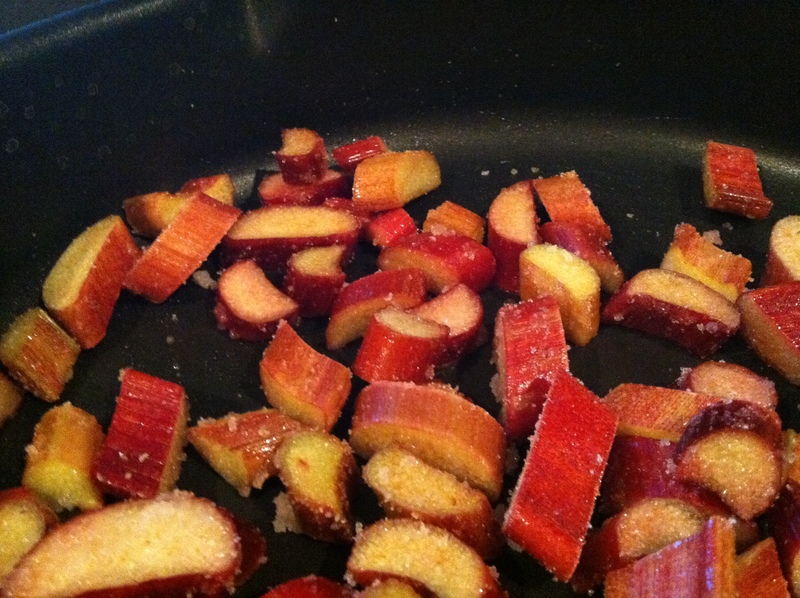 Heat the oil in a large skillet, add the rhubarb and sugar. Saute until the rhubarb has given up its liquid and is still a little firm. 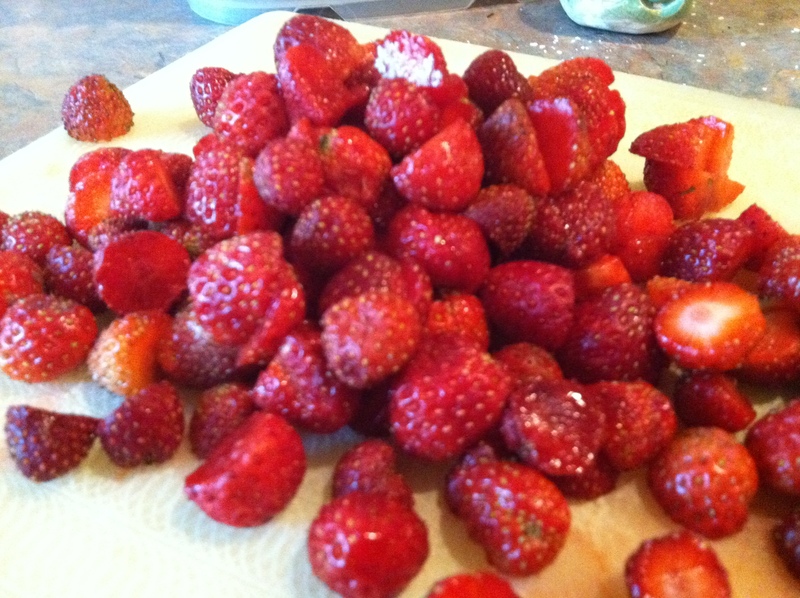 In a medium bowl, combine the strawberries and sugar and allow to macerate. I ended up storing both fruits separately in the refrigerator over night. Combine the rhubarb mixture and the macerated strawberries in a medium sauce pan on low heat and simmer, stirring occasionally, until the rhubarb has lost its shape. THAT is how easy the jam was! And then we had cake… 🙂 Take it away Cheese Girl. This recipe came from my new-ish cookbook that I have not made anything but lemon bars from. Mom was looking for a shortcake recipe but she decided that the biscuit type cakes that that recipe made were too much like biscuits and flipped through the pages until finally landing on this: Kentucky Butter Cake. 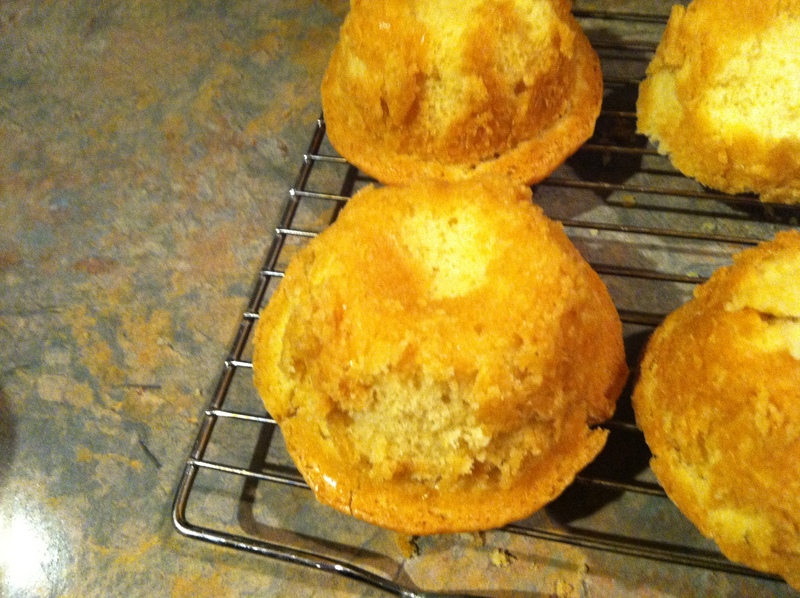 Bastardizing them to fit our need of individual cakes I christened them Butter Muffcakes. Perhaps not the best name possible but it suits the cakes nicely. First, preheat your oven to 325°. Then, place the butter and sugar in a large bowl and mix with an electric mixer until creamy, about 2 minutes. After that, add the eggs one at a time, and mix until smooth after each egg. As yummy as it looks resist the temptation to eat the uncooked batter. Remember that there are 4 eggs in it and keep your fingers away from the bowl. Fourth, mix in the vanilla, baking powder, salt, and baking soda and combine for 1 minute. Alternately add the sour cream and flour, 1/3 at a time, mixing after each addition. Mix for 3 minutes after all of the sour cream and flour are added. And finally, spray then flour your muffin tin to ensure that the muffcakes can come out. Fill the cups half full and bake for 20 minutes or until a toothpick comes out clean. Butter Muffcakes can be eaten alone or with jam. 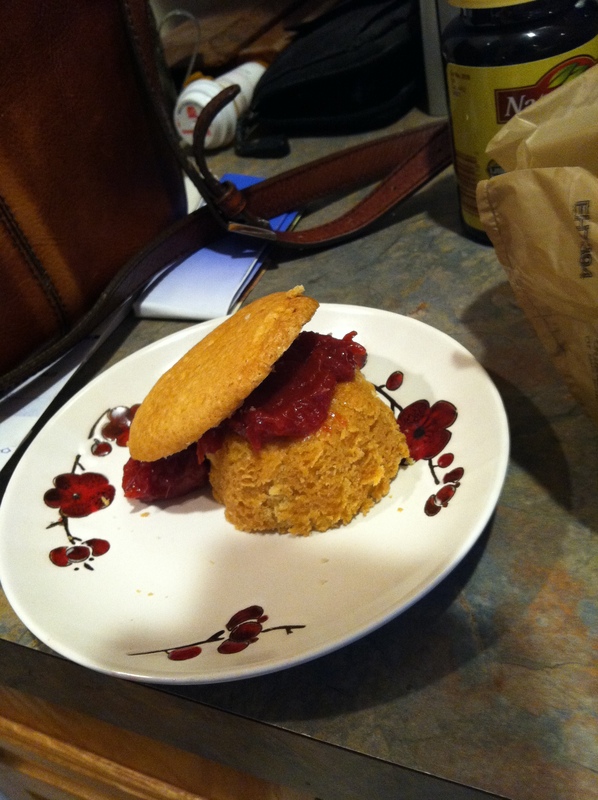 Mom flipped hers over and topped it with jam, but I had a flash of inspiration, cut the top off, topped the newly cut muffcake with some jam, added a small mound of jam to the side, put the top on the slant, and deemed it beret style. CSA Mom here: I took these to a party on Friday and got rave reviews. The cake was moist and not too sweet and the jam had just enough tartness. My husband and son were out of town for a few days, and there aren’t any left, so they totally missed out this time. Too bad for them! We compost our vegetable waste, coffee grounds and corks. 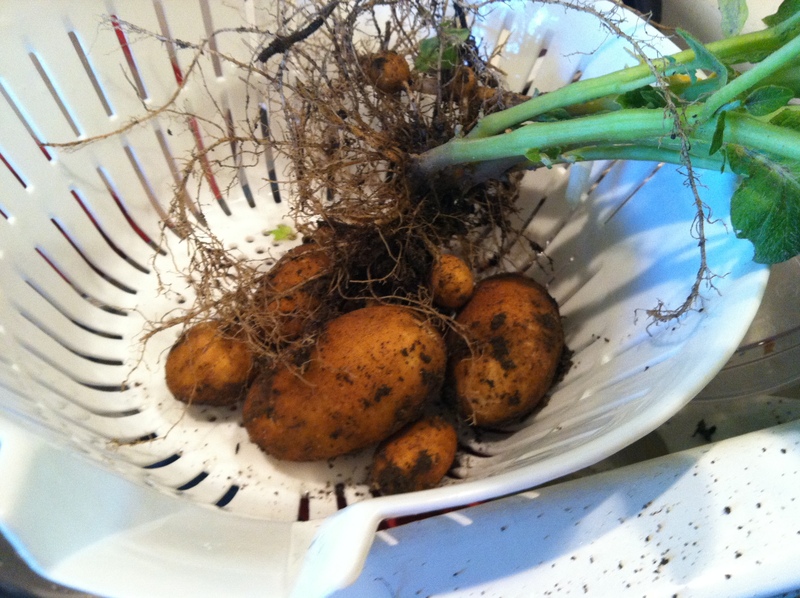 Last winter, for the first time, I kept adding to the compost all year long. In the Fall, it was a little surprising to open the container and have steaming, stinky, compost air hit you in the face, but eventually it did get cool enough to stop really “cooking”. We planted a garden this year and used a lot of the compost, definitely before it was completely broken down. We have some very “squash-y” looking plants that volunteered and we are just waiting to see if we get warty pumpkins, or some other exotic squash from last year’s CSA. We do have a few volunteer tomatoes again this year that we are looking forward to as well. 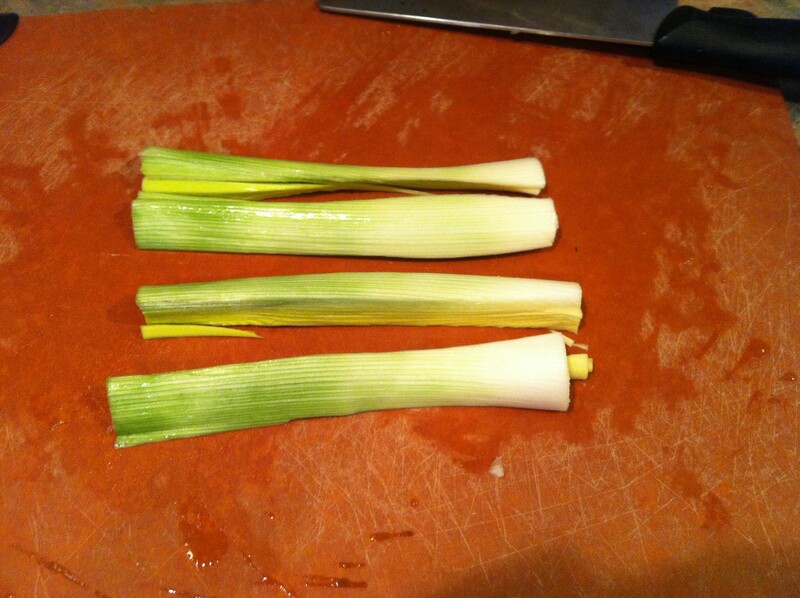 There were a few other green leafy plants that did not look like lettuce. We had no idea what they were, but the leaves were pretty and green, so maybe it was some sort of a flower. I had geraniums planted in that area last year and had dahlias in there before that. They didn’t look like geraniums at all, but could be some sort of dahlia. They did not look evil, like a weed. So we decided to let them grow and see what they might turn into. Tonight I was weeding in the garden (for the first time in weeks, so there were LOTS of weeds). I saw these plants and by now they are about 18 inches tall, the bugs were getting to the leaves, and they still didn’t seem to be doing anything, so I decided to pull them out and make room for something yummy, like beets. Holy cow! I ran in the house to show the kids, who were suitably impressed. My husband was out in the yard somewhere, so we started around the house to show him. We picture the aerial view as him walking around the house looking for us, me with the two kids, a colander of dirty potatoes and a plant in my hands walking in circles looking for him, and the cat following us all trying to figure out WHAT the heck all the fuss is about. The plant had a few tiny danglers on the roots, so we threw them back in the garden and hopefully we will get more. 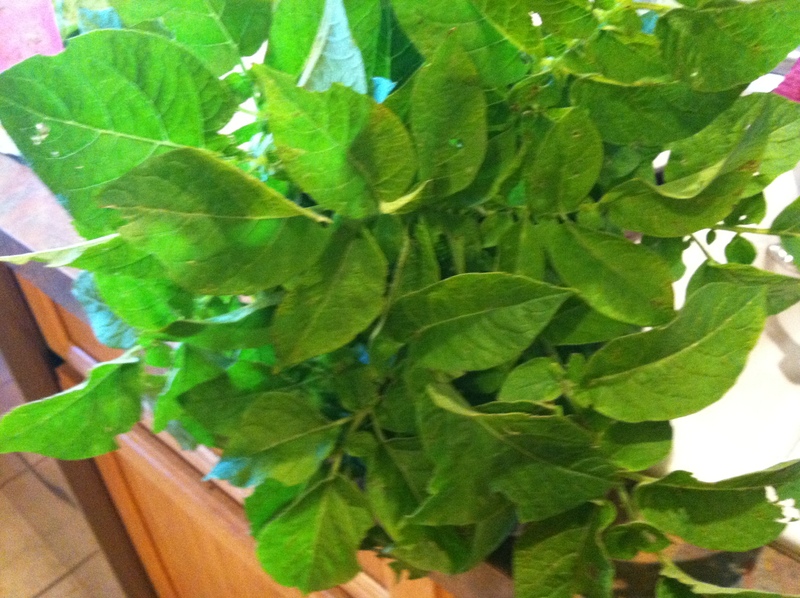 The other plants we left to see if the potatoes get bigger. 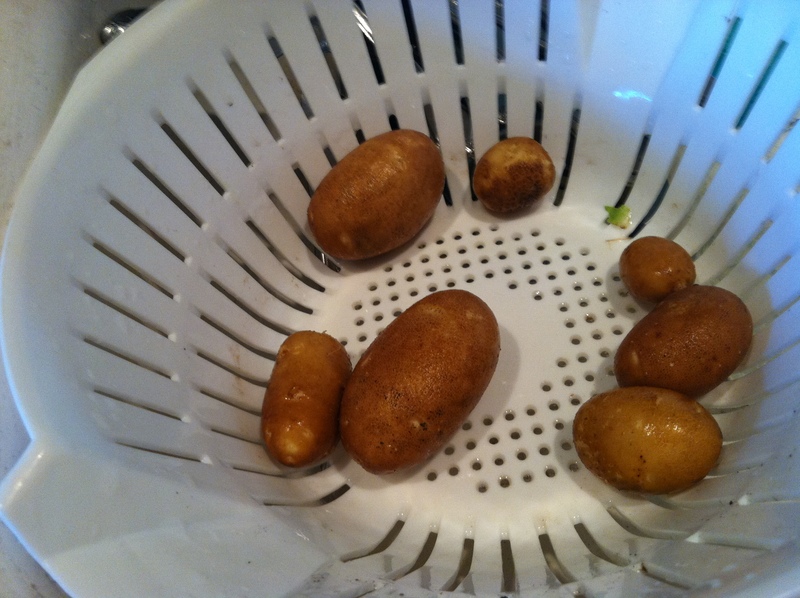 When do you know it is time to harvest potatoes?